Thanks to a tweet by EVO editor Harry Metcalfe, it has been confirmed that the Lamborghini Urus super sport utility vehicle has gotten the green light for production in 2017 and while that is still a couple years away – this is the first positive confirmation that Urus will indeed be built. While we were busy fawning over the new Lamborghini Egoista, we almost missed the announcement that the Italian supercar maker has confirmed production of the Urus high performance SUV for 2017 and while it doesn’t come from an official company representative, we are inclined to trust the tweet posted by the editor of EVO. This unofficial intent to produce the Urus indicates that the super ute is on its way in the next few years although it is unclear whether that is a 2017 model year or a 2017 start of production. A 2017 start of production could mean that the Lamborghini Urus SUV could be a 2018 model year vehicle but that just seems so far away…would the company really tease a production vehicle 5 model years in advance? 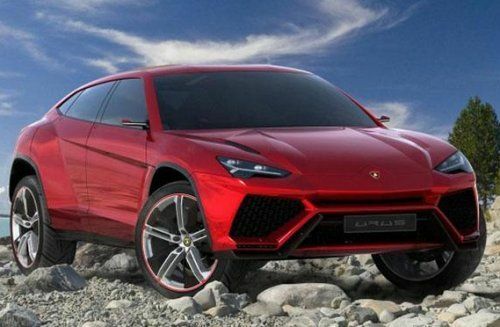 I would guess not so I would guess that the Urus will be a 2017 model year vehicle and that means that the Lambo SUV could arrive as early as the spring of 2015 – less than two years away. The Lamborghini Urus super sport utility vehicle is expected to ride on the same platform as the next generation Audi Q7 and Porsche Cayenne along with the upcoming Bentley high end luxury SUV. There have not been any real drivetrain specifications offered up by the Italian supercar builder but it is widely expected that the Urus will derive its power from a hybrid system that incorporates a twin turbocharged V8 and an electric hybrid assist system for a combined output of around 600 horsepower. We can expect that the power will be channeled to all four wheels via a 7-speed dual clutch gearbox and an advanced all wheel drive system that will make this Lambo SUV unbeatable on a race track and unstoppable in even the worst winter weather conditions. The internet rumormill suggests that the Urus will cost somewhere in the range of $175,000 to $200,000 when it arrives and while that is a whole lot of money for an SUV – it would be affordable by Lamborghini standards. There was a point in time where an Italian supercar builder like Lamborghini introducing a sport utility vehicle would be little more than a quick publicity stunt but the modern supercar world has a very large group of buyers who want the fun of a high performance car and the versatility of an SUV. Some potential Lamborghini buyers may turn away from the likes of the Gallardo or Aventador because these two seaters don’t have any room for a family but with the Urus – Lambo owners would have a vehicle that can very comfortably seat four while also being able to serve as a year-round daily driver. Although the Gallardo and Aventador both offer a high performance all wheel drive system, I would wager that few of the owners of those supercars use them much in the snow. On the other hand, the Urus would give Lamborghini owners a chance to enjoy their Italian luxury super SUV regardless of the weather or road conditions. The high performance, high end luxury super SUV segment is rapidly growing so it only makes sense that one of the global leaders in high end supercars would introduced a super ute of their own so much like the Lamborghini cars help to constantly re-revolutionize the sports car segment – we fully expect for the Lamborghini Urus to have a similar impact on the performance SUV segment when it arrives.